The U.S. Department of Transportation's National Highway Traffic Safety Administration (NHTSA) and the Insurance Institute for Highway Safety (IIHS) announced today a commitment by 20 automakers to make automatic emergency braking (AEB) standard on their cars. "It's an exciting time for vehicle safety," said U.S. Transportation Secretary Anthony Foxx. "By proactively making emergency braking systems standard equipment on their vehicles, these 20 automakers will help prevent thousands of crashes and save lives. It's a win for safety and a win for consumers." The automakers represent 99% of the U.S. auto market, meaning AEB will be standard on virtually all new all new light-duty cars and trucks with a gross vehicle weight of up to 8,500 lbs. within six years. AEB will be standard on virtually all trucks with a gross vehicle weight between 8,501 lbs. and 10,000 lbs. beginning no later than Sept. 1, 2025, NHTSA said. NHTSA estimates that the agreement will make AEB standard on new cars three years faster than could be achieved through the formal regulatory process. During those three years, according to IIHS estimates, the move is expected to prevent 28,000 crashes and 12,000 injuries. This isn't the first time automakers have made such a pledge. Last September, 10 leading automakers pledged to make AEB systems standard. The previous pledge came in response to a challenge by NHTSA and IIHS. In December, NHTSA announced plans to rate AEB systems and other advanced technologies under its 5-Star Safety Ratings beginning in model year 2018. 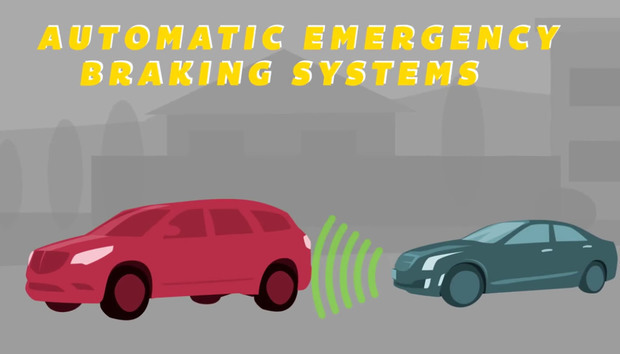 Automatic emergency braking (AEB) systems detect an impending forward crash with another vehicle in time to avoid or mitigate the crash. The systems initially alert the driver to the impending impact to allow them time to take corrective action to avoid it. If the driver doesn't respond fast enough to avoid the accident, the AEB system will automatically apply the brakes to help prevent or reduce the severity of a crash. "It's an exciting time for vehicle safety," Foxx said in a statement. "By proactively making emergency braking systems standard equipment on their vehicles, these 20 automakers will help prevent thousands of crashes and save lives." The automakers who committed to the AEB deal include: Audi, BMW, Fiat Chrysler, Ford, General Motors, Honda, Hyundai, Jaguar Land Rover, Kia, Maserati, Mazda, Mercedes-Benz, Mitsubishi, Nissan, Porsche, Subaru, Tesla, Toyota, Volkswagen and Volvo. The feature will also be standard on most medium-duty trucks by September 2025. "The benefits of this commitment are far reaching -- from injuries and deaths averted to the recovery of productivity that would otherwise be lost in traffic jams caused by the crashes prevented," IIHS Chief Research Officer David Zuby said in a statement. "It also assures that all Americans will benefit from this technology." NHTSA and IIHS also announced that Consumer Reports will assist in monitoring automaker progress toward meeting the AEB commitment. "We have been calling on automakers to make automatic emergency braking standard in all new vehicles, and today is an important step toward reaching that goal," said Jake Fisher, director of Auto Testing for Consumer Reports. "This proven technology is among the most promising safety advances we've seen since electronic stability control almost two decades ago. We look forward to working with NHTSA and IIHS to help put this plan into action and hold automakers accountable for their commitments." As NHTSA continues its regulatory work, the agency plans to track the automakers' efforts to keep their commitment to the technology. That commitment takes into account the evolution of AEB technology. It requires a level of functionality in line with research and crash data demonstrating that such systems are substantially reducing crashes, but does not stand in the way of improved capabilities that are just beginning to emerge. The performance measures are based on real world data showing that vehicles with this level of capability are avoiding crashes. To encourage further development of AEB technology, NHTSA will accelerate its research on more advanced AEB applications, including systems that reduce the risk of collisions with pedestrians.